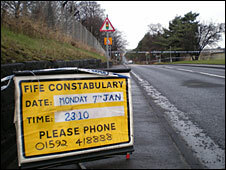 A fall has been recorded in the number of people killed or injured on the roads in Fife, police have said. Annual statistics showed that 14 people were killed in road accidents in 2007, five fewer than the previous year. Figures released by Fife Constabulary also showed that 137 people were seriously injured over the same period with 628 people having minor injuries. The Chief Constable, Peter Wilson, has praised the efforts of drivers in helping to cut the accident rates. He said: "Communities across the Kingdom should be impressed by the major achievement in reducing the casualty statistics. "The motoring public of course must also take the credit for playing their part. With their help we can continue to make Fife an even safer place." In March, two students from Elmwood College in Cupar were killed when their Renault Clio was involved in a crash with two other vehicles on the A91 near St Andrews. Duncan Beaton from Forfar and Robert Jamieson from Kilmarnock, both 18, were involved in a head-on crash. A third car then hit the wreckage. In January, 47-year-old Alan Mitchell, a pedestrian, was killed while crossing Kennoway Road on the outskirts of Leven. He was hit by a Peugeot 205 car just days before he was due to be married. Fife Council's road safety manager, Jane Greer, said: "Even with this excellent reduction in casualties on Fife's roads, many people have still suffered tragic circumstances during 2007 in relation to road crashes and the work has to continue to endeavour to reduce the figures even more and prevent others suffering in future years." The overall figure for accidents has seen the steepest fall in recent years. In 2004, there were 1,014 recorded injuries in Fife and that number has been reducing annually by about 100. The most recent drop has been almost double previous years, from 808 to 628 injuries and fatalities. Dr Bob McLellan, head of Fife Council's transportation services, said: "The trend continues downwards, with 2007 being a landmark year in Fife, seeing us achieve or exceed the 2010 national target for reductions in road casualties."